Sown by refugee women who have been relocated to the US. Their baby collection includes adorable bib and bootie sets, diaper pouches and more. Made from vintage and repurposed fabric. Styles also available for mama. Fun, soft and rubber soled shoes in a variety of different styles, including moccasin booties and Mary Janes. Apparel and boys also available. Bloomers, pants, tops, dresses, hair accessories and more. Fun, soft colors and prints, plus playful silhouettes. Some of the adult items on their site are made overseas, origin is noted. Little girls rompers made from primarily deadstock and natural fabric’s. The fabric is left over from larger fashion houses, using this material saves it from ending up in the landfill. Since the fabric is in limited supply each dress style is limited edition. Timeless, yet modern and comfortable designs. Some pieces are made from organic cotton and other sustainable fabric blends. The styles are fun, sophisticated and you'll probably wish they fit you, luckily they have a women's line as well. 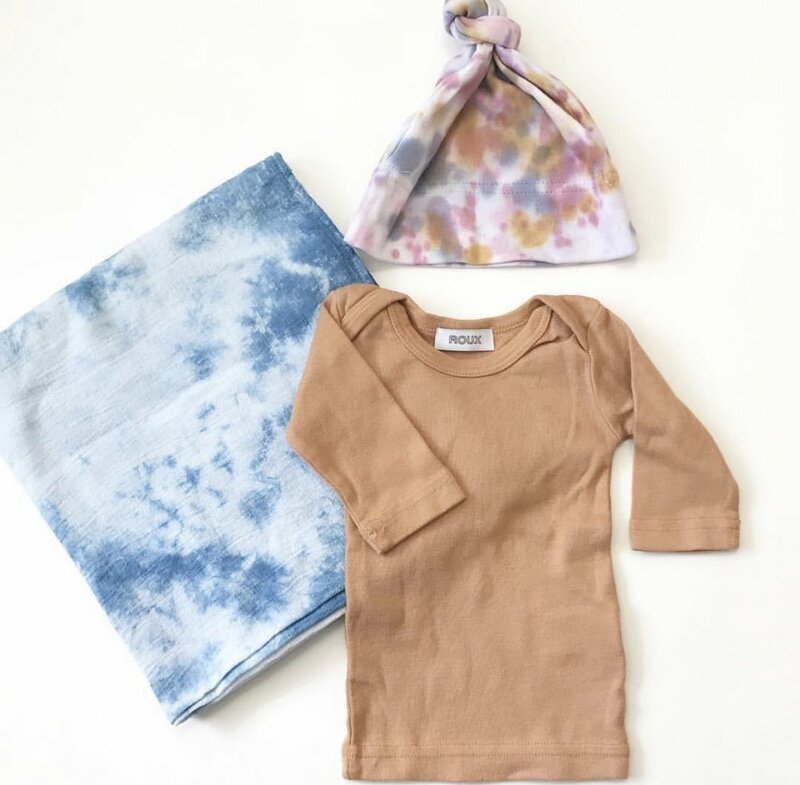 Comfy clothing for little ones in the most perfect array of colors (think dusty rose, terra cotta, sage and muted lavenders). Their solids are lovely but they also offer some adorable hand stamped patterns, like their yin yang print and tie dye options. Along with clothing Roux makes bibs and swaddles, plus they offer some natural apothecary items through their site. Baby carriers crafted from fine all natural fabrics, in everything from dreamy muted pastels to rich jewel tones. They have their classic Ring Sling as well as two shoulder strap styles, with options to carry either on your front or as a backpack. The sling is suitable for babies up to 35 pounds and the larger of the two strap carriers (the Scout) goes up to 45 pounds. Adorable modern cuts and fun playful patterns for your kiddo, made by mama and designer Graciela Portillo. A portion of your purchase goes to charity. Seasonless rompers, overalls, playsuits and more, made from natural fabrics. Some styles have been hand dyed with natural plant dyes, the overall color palette is muted, neutral and modern. *Shop currently on a break. Modern and stylish teepees that make the perfect fort for your little ones, tents and other accessories also available (note not all accessories are made in the USA).